On 25th January, the first day sales for the limited edition Proof 2018-W American Eagle platinum $100 coin totaled 4,420 pieces. The numismatic product is limited to a maximum release of 20,000 coins, with a household order limit of one coin. The price of each coin is $1,420. The 2018 issue is the first coin of a three-year series, whose designs reflect the unalienable rights of Life (2018), Liberty (2019) and Pursuit of Happiness (2020) from the Declaration of Independence. The coins will have a common eagle reverse, with the obverse design changing every year. 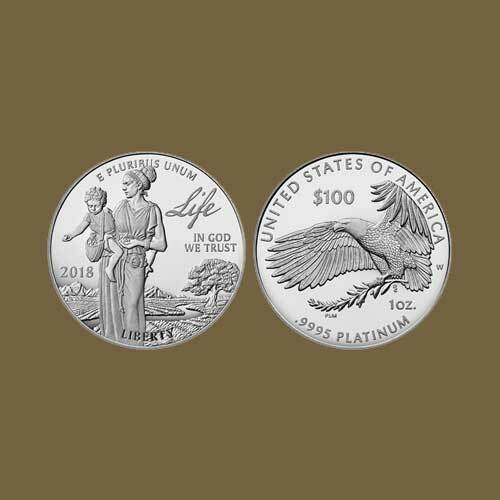 The Proof American Eagle platinum series was introduced in 1997 and since then the reverse design has changed annually, paired with the common Statue of Liberty portrait obverse. The Proof 2017-W American Eagle platinum coin, which marked the series’ 20th anniversary by using on its reverse the Eagle design introduced in 1997 was limited to a mintage of just 10,000 coins. It sold out in just over a week at a purchase price of $1,300 each. The 2016 edition, which had a distinctive one-year reverse design and a mintage limit of 10,000 pieces, sold out in approximately 56 minutes at a price of $1,350 per coin. The 2015-W coin also sold out quickly, but at a mintage of just 4,000 pieces priced at $1,200 per coin. On 2nd November 2017, sales recorded on eBay show $2,825 paid for a 2015-W example graded Proof 70 Ultra Cameo by Numismatic Guaranty Corp. and encapsulated with an Early Releases label. A price of $1,999 was paid Dec. 15, 2017, for an NGC Proof Ultra Cameo 2016-W coin with an Early release grading label, and $2,441.95 was paid Jan. 25, 2018, for a 2017-W coin graded NGC Proof 70 Ultra Cameo with an Early Releases label.